A perfect addition to any fan's collection with gorgeous images and wonderful insight into the making of the film. This book is beautifully presented and every page is a delight. The Weta team are truly amazing and I shall certainly be buying all the future books in this series. 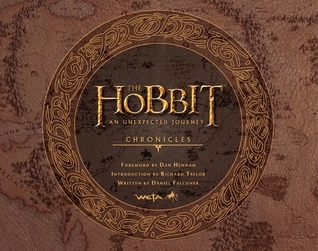 The Hobbit Chronicles: An Unexpected Journey Art & Design is absolutely a 'must buy'. The Hobbit: An Unexpected Journey Chronicles, Creatures & Characters explores the amazing cast of heroes and villains, beasts and beings that populate Middle-earth in the first chapter of Peter Jackson’s film adaptations of J.R.R. Tolkien’s The Hobbit. Richly illustrated with behind-the-scenes photographs, digital renders and film stills, this comprehensive book goes species by species, character by character, through the film’s huge ensemble of characters and bustling menagerie of creatures, both physical and digital, telling the stories of how each came to be realized for the film. Another gorgeous book, The Hobbit Chronicles - An Unexpected Journey Creatures and Characters focuses, as you might expect, on the work done by the Weta team bringing the various characters of Middle Earth to life. 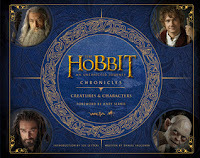 From Hobbit feet to goblins, not a thing is missed out in this wonderful companion book to the film.